About a month ago I woke up on a friend’s couch after a big night out – we were having an afterparty for a roller derby bout we played in, and the place was serving this drink called a TVR, which I’d never heard of before. It’s Tequila Vodka Redbull, and it is pretty well guarunteed to make any event more energetic. Anyway I woke up in the wrong team uniform, with a business card down my top, what was (probably) cake dried in my hair, a phone number with the words “If lost please call” written across my chest, and this pin braided into my fringe. Apparently I bought it at an all night games parlour after losing badly at air hockey and declaring the need to buy the winner a trophy. Then, I’m told, I won it back while playing pool and hitting a passer-by in the head with the white ball. By accident, I mean. Anyway, I love the book and am looking forward to the next one. Enjoy my trophy! This creature sure looks happy, despite having more eyes than teeth! 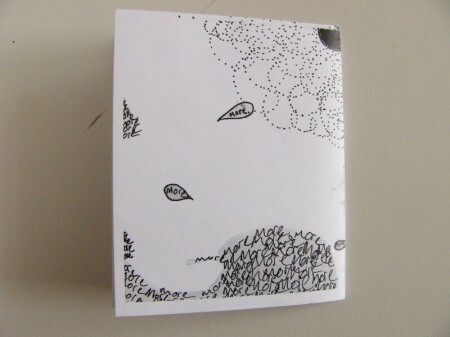 PS There’s also a drawing of my hand on the back. I’m trying to learn how to draw but so far hands are the only thing I can manage. In my experience, hands are very difficult to draw, so if you are good at them then you’ve already got a leg up! Take it easy on the TVRs. I know someone who woke up knowing how she was going to die, and her life was never the same. More pictures on our Flickr page! 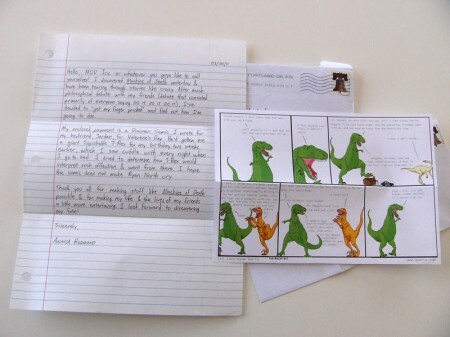 More reader mail blog posts here! 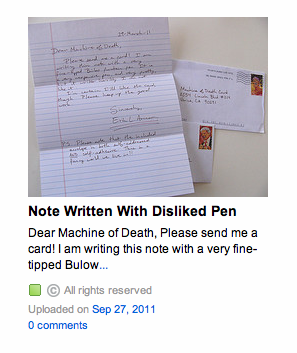 Or, send us something yourself! P.S. – That is really my last name! I love it. So polite! Thanks for the opportunity to get to know Mr. Winston and his yellow-beclad friend. And “Coffin” is a sweet last name. 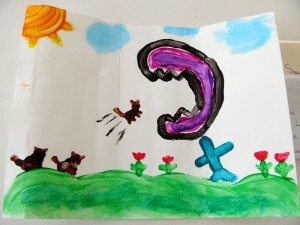 This drawing is like an action scene at the opening of a movie. I don’t know what’s going on here, but I’m intrigued enough to want to find out, and in the meantime there’s plenty for me to look at. I don’t know who this lady is, but I like her. 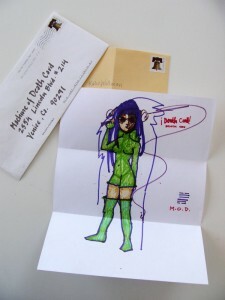 I’m not sure if her name is Death Card, like she’s a super hero or a wrestler or something else that requires a unique pseudonym, or if the artist was just really excited about getting a death card. 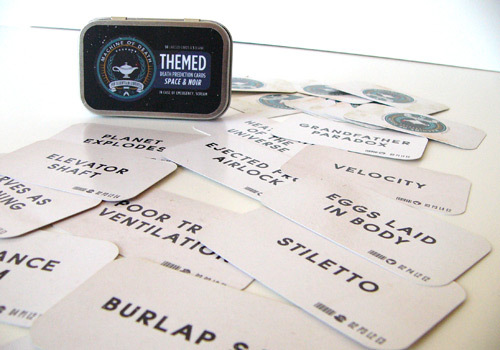 These are the sorts of mysteries that we encounter every day here at MOD. Anyway, check out the calligraphy on the envelope this woman arrived in. Fancy! Would you like to draw us something, or just mail us an old drawing you have sitting around? We’d love to hear from you! Don’t be shy. We’re nice people. Honest. 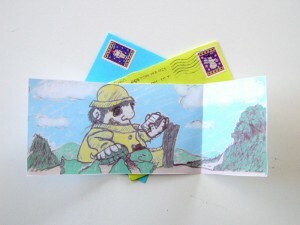 Here comes another piece of mail we’ve received in exchange for a Death Prediction Card! 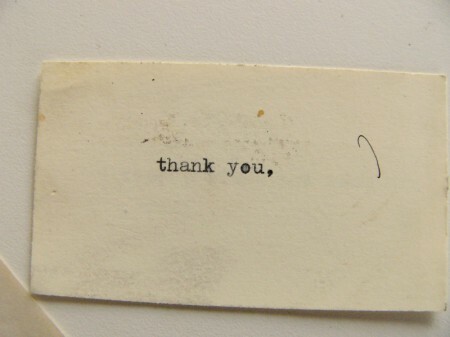 Maybe this card was meant to be read with “Thank you” first, with “you make the world a better place” coming later. Maybe I made a mistake in arranging these photographs in the way I have. But let’s move on from this fairly simple mystery to a far more interesting one. 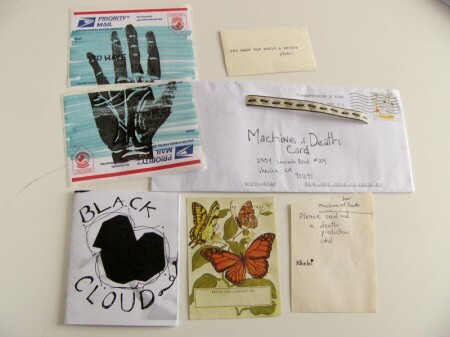 “Black Cloud” turns out to be a book! We found we could open it and see more pages. 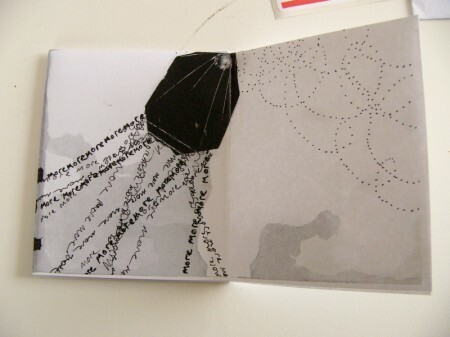 Pages with images and words for us to think about. 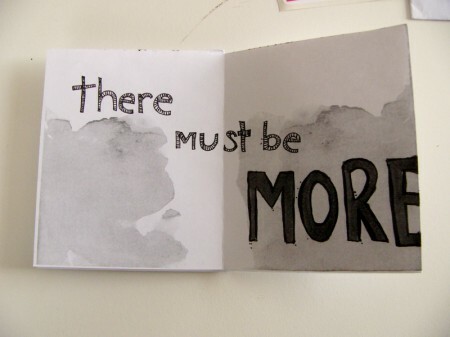 Black Cloud Pages 5 and 6: moremoremoremoremoremore… etc. Black Cloud Page 7: More. More moremoremoremore etc. So what does all this mean? I guess it means what you want it to mean. Or it means whatever the creator says it means. Since I haven’t heard any explanation, I’m assuming it’s about the frustration a person feels when, upon finally receiving some piece of knowledge or guidance, the knowledge doesn’t live up to the person’s anticipation. That’s, um, that’s just me. I’m the girl who thought Kafka stories were totally simple until we started arguing about them in 8th grade English, so I’m certain there’s more room for interpretation here than my simple analysis allows. ALSO: David and Ryan have just gotten back from a week at Comic-Con, so we should have updated submission data for your edification very soon — as well as winners of the Facebook contests! Stay tuned! We received a Dinosaur Comics remix. Taking Ryan North’s Dinosaur Comics and turning them into new and exciting projects is a time-honored tradition. Ryan does it every weekday! It’s also how Machine of Death started, as you may know. 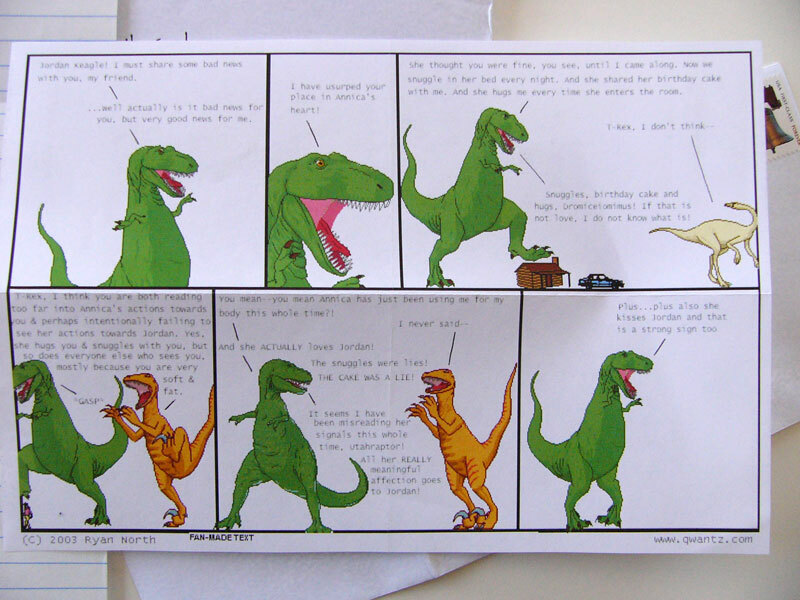 One fan-created Dinosaur Comics remix arrived in our mailbox as part of our mail-order Death Prediction program. Hello, MOD Inc. or whatever you guys like to call yourselves! 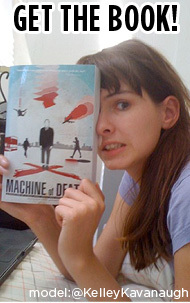 I discovered Machine of Death yesterday & have been tearing through stories like crazy. After much philosophical debate with my friends (debate that consisted primarily of everyone saying DO IT DO IT DO IT), I’ve decided to “get my finger pricked” and find out how I’m going to die. 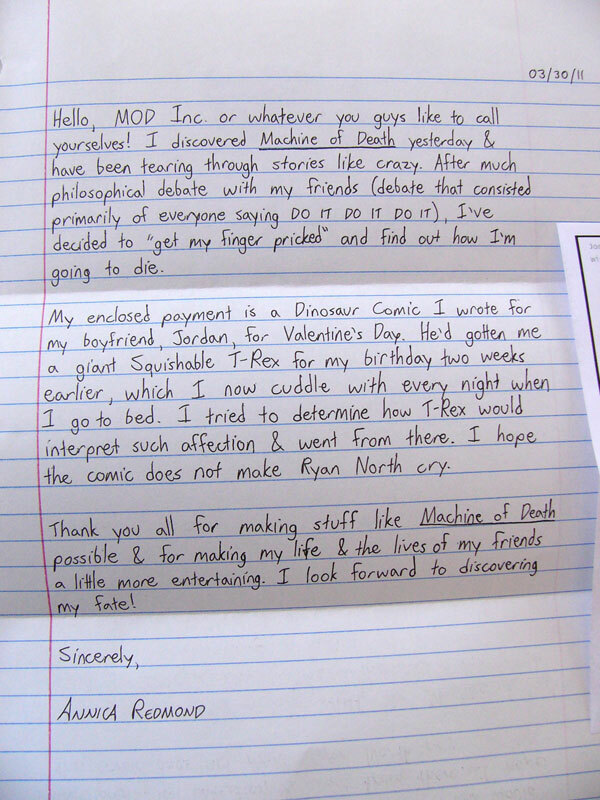 My enclosed payment is a Dinosaur Comic I wrote for my boyfriend, Jordan, for Valentine’s Day. He’d gotten me a giant Squishable T-Rex for my birthday two weeks earlier, which I now cuddle with every night when I go to bed. I tried to determine how T-Rex would interpret such affection & went from there. 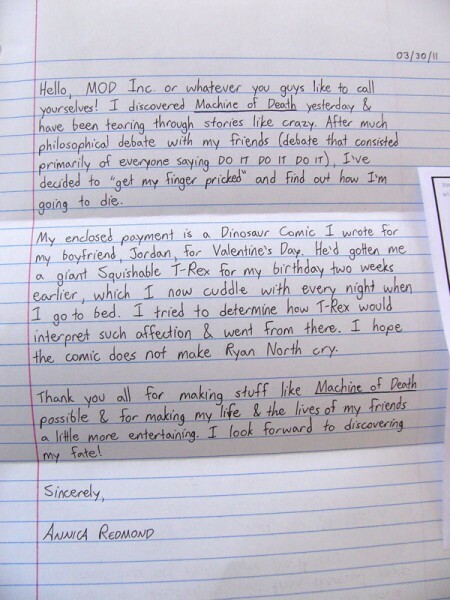 I hope the comic does not make Ryan North cry. Thank you all for making stuff like Machine of Death possible & for making my life & the lives of my friends a little more entertaining. I look forward to discovering my fate! T-Rex: Jordan Keagle! I must share some bad news with you, my friend…well, actually it is bad news for you, but very good news for me. T-Rex: I have usurped your place in Annica’s heart! T-Rex: She thought you were fine, you see, until I came along. Now we snuggle in her bed every night. And she shared her birthday cake with me. And she hugs me every time she enters the room. T-Rex: Snuggles, birthday cake and hugs, Dromiceiomimus! If that is not love, I do not know what is! Utahraptor: T-Rex, I think you are both reading too far into Annica’s actions towards you & perhaps intentionally failing to see her actions towards Jordan. Yes, she hugs you & snuggles you, but so does everyone else who sees you, mostly because you are very soft & fat. T-Rex: You mean–you mean Annica has just been using me for my body this whole time?! T-Rex: And she ACTUALLY loves Jordan! The snuggles were lies! THE CAKE WAS A LIE! It seems I have been misreading her signals this whole time, Utahraptor! All her REALLY meaningful affection goes to Jordan! T-Rex: Plus… plus also she kisses Jordan and that is a strong sign too. 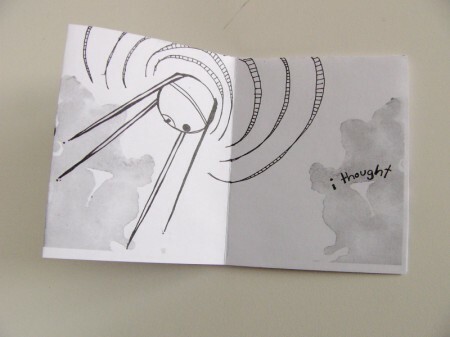 Thank you for sending us this comic! I hope Jordan appreciated it as much as we do.